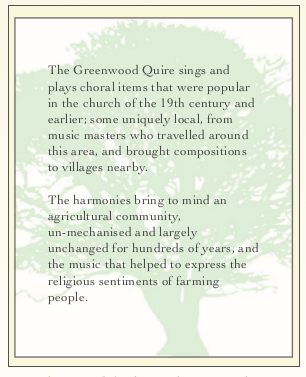 The church, or possibly squire, would fund a Music Master to come to the church and coach the villagers in singing. These music masters would often have for sale their own music books. There is evidence that one Music Master, William East, 1667-1758, from Waltham on the Wolds (between Grantham and Melton) worked in this area of South Lincolnshire, at the church in nearby Corby Glen. The book was is owned and in the possession of Mr Steve Taggart of Ryhall, who realised its significance after being alerted by Pete Shaw in the early 1990’s. 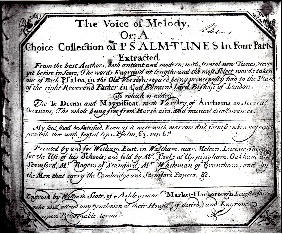 In the middle 1600s singing in ordinary churches was almost wiped out. Hymns, (the words of men) were banned and even the Psalms, (the words of God) had to be slowly chanted. So Parishes were encouraged to start their own Quires (spelled with a Q) of amateurs from village and farm. 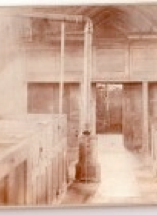 To create a place for the Quire at the lowest cost, a high wooden gallery was often constructed at the West end of the church, with two or three rows of benches and a staircase at the side. We know that there were local Galleries: at Kirkby Underwood (until 1894); and this photograph of the gallery at St Andrew’s, Haconby was taken before its demolition in 1899. Twas so mortal cold that year that they could hardly sit in the gallery. So Nicholas brought a gallon of hot brandy and beer, to church with him- just a thimbleful in the Absolution, and another after the Creed, and the remainder at the beginning o' the sermon. When they'd had the last pull they fell asleep, every man jack of 'em; and there they slept on as sound as rocks. The sermon being ended at last, the pa'son gie'd out the Evening Hymn. But no choir set about sounding up the tune. '"Hey? what?" says Nicholas, starting up; and the church being so dark and his head so muddled, away he went, bow and fiddle, at "The Devil among the Tailors," the favourite jig of our neighbourhood at that time. Then Nicholas, shouted out as he scraped, "Top couples cross hands! And when I make the fiddle squeak at the end, every man kiss his pardner under the mistletoe!" The pa’son’s hair fair stood on end. "Stop, stop, stop! Stop, stop! What's this?" But they didn't hear the pa’son for the noise of their own playing. The days of West Gallery are considered to be between 1685 and 1830. There are many reasons put forward to explain their demise: the desire of clergy to regain control of the sung matter from the idiosyncratic quire; the musical purists who disliked the tunes and arrangements that broke many musical rules; church restorers who did not choose to replace the by now old and creaky West Galleries. Out went the quirky musicians and their hand-written tunes; in came local schoolmistresses playing the harmonium and eventually, in 1861, Hymns Ancient and Modern.